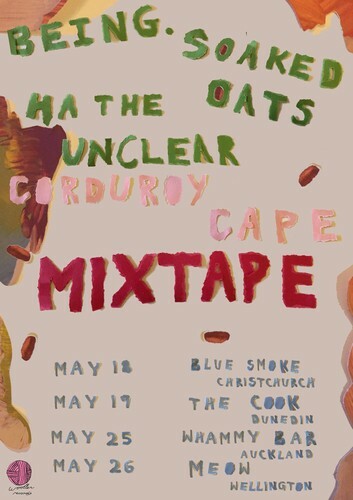 Being., Soaked Oats and Ha the Unclear will celebrate their new split release Corduroy Cape: A Persnickety Mixtape with a circus in May across four dates in Auckland, Wellington, Christchurch, and Dunedin. The Corduroy Cape Mixtape is a peep into each band's sock drawer, lint filter and vacuum bag. A pot-pourri of covers, unreleased material and special demo cuts, a whiff of the familiar and a niff of new noises. It is Pop-hearted and indie-scum, hard cheese and the morning muesli, all glued together with a collegial spirit and a like-minded lilt. Tracks will be released in a stagger over the next few weeks with Being. 's 'Fold Into The Sea' first to arrive on Monday April 30. The seed for the split release was sown during an overzealous post-show conversation when everybody involved shared a bill at Auckland's Whammy Bar. Composed mostly of hand gestures, yelling and disproportionate body language it was ordained and somehow communicated that said split release should contain both a cover and an original from each band. The Corduroy Cape Mixtape was conceived.